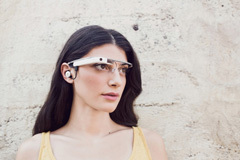 What Is New With The New Google Glass? Not Much. Home > Google News > Misc Google > What's Different With New Google Glass? Everyone is making a lot of buzz around the new updated version of Google Glass but what is really different outside of those fashionable ear buds? Dan Baran met up with his friend who picked up the new version of Google Glass and compared the original Explorer Edition with the new one. He posted his findings on Google+ saying there are very minimal differences. Obviously the ear buds, but you should know the buds work on both the first generation and the second generation versions. The shields are more curved at the top with more of a gap, possibly to allow for better perscription shield fittings? That was it, he noticed no changes to the battery or anything else on the new model. I guess this was expected. Still he will be swapping his original version in for the new model.